While browsing reddit.com this morning, I came across a link to an op-ed piece in the Washington Times by none other than internet expert John McCain. In the article, John makes a legitimate argument that the internet must remain free and open, that internet service providers must not be allowed to shape access to content and restrict bandwidth based on the destination of that bandwidth. In other words, John McCain supports Net Neutrality. John goes on to state that he does not support Net Neutrality. While it seams confusing, as McCain is in essence contradicting himself, if you apply the concept of doublespeak, it all makes a lot more sense. So if it seams like McCain’s article is illogical gibberish, well it is and was intended to be so. Yeah, well that’s what happens when a politician speaks in doublespeak instead of speaking in plain language. McCain is utilizing the argument of Net Neutrality supporters to rail against Net Neutrality. The New York Yankees are the best baseball team of all time because they’ve won twenty-six World Series. The New York Yankees are the worst baseball team of all time because they’ve won twenty-six World Series. Friends, this type of illogical statement is exactly what John McCain is using to scare the American public into killing the internet. Did you know John McCain does not use a computer? While, I don’t care that he does not use a computer, I find it absurd that he has the gall to speak about the internet, as he literally has no clue. I have never used a motorcycle. Although I have nearly no knowledge of motorcycles, I propose that we must not allow the government to dictate that motorcycles should move. If we allow the government to dictate that motorcycles should move, the motorcycle industry will fail and die as they will not be able to innovate new motorcycle types, such as a stationary motorcycle. Does that make any sense? Of course not. Does John McCain make any sense in promoting a free and open internet by railing against a rule that would force a free and open internet? Why does John McCain say these things? Because he’s the number one politician when ranked by amount of contributions from telecommunications companies. Because he has nothing to lose. Because he very well may have crossed that threshold of mental competence that old human beings tend to cross. Because he wants big business, big corporations to succeed and does not care what happens to individuals and small businesses. Because John McCain is corrupt. John McCain claims to support a free and open internet. Net Neutrality requires Internet Service Providers maintain a free and open internet. John McCain does not support Net Neutrality. Still confused? That’s OK. 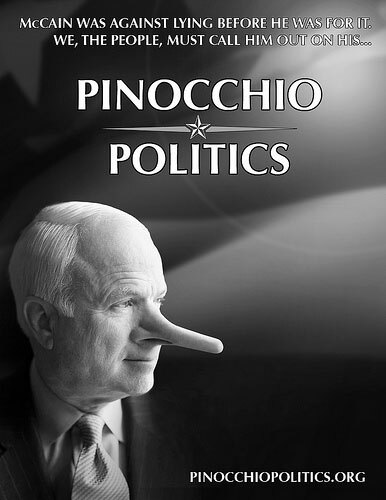 The intent of John McCain is to confuse you. Basically, John McCain is lying and you should never trust anything he says involving technology because plainly put, he has no knowledge of it. Here’s what you need to know, if you want the internet to remain free and open, and require that Internet Service Providers be unable to discriminate based on content, support Net Neutrality. Otherwise, if you want the internet to look this way, log off and don’t come back. JM is a honorable man. I just wish he was the president in 2000. No doubt? Really? Show me your indubitable proof. Guess it depends on how you define honorable.